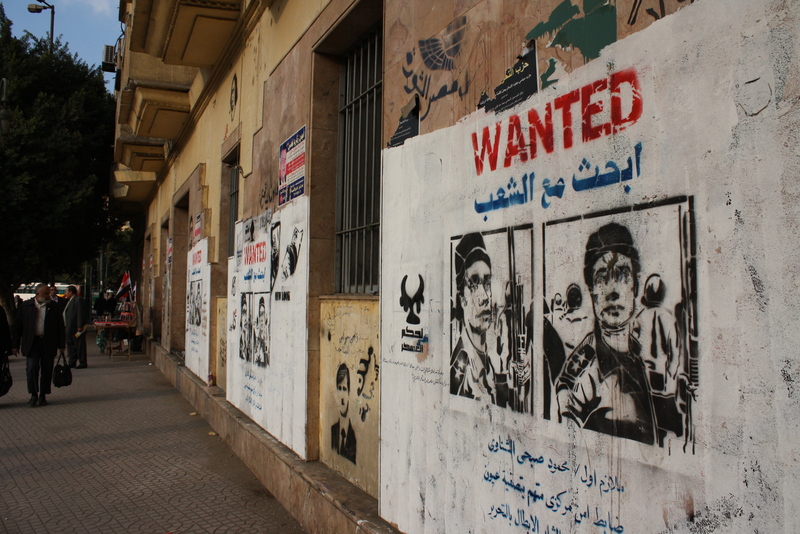 Stencils cover the walls on Tahrir square. Barely in existence before the revolution, as I imagine the penalty was high for tagging Cairo’s already-rusted walls, grafitti in various forms has sprung up all over the city since the revolution. Stencils, murals, satirical posters, etc. 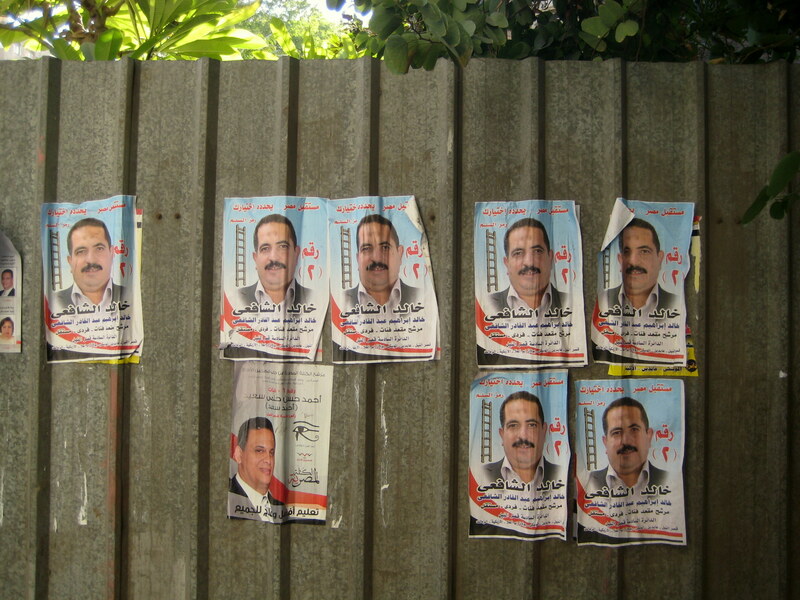 are primarly concentrated around Tahrir Square, but can also be found in Zamalek and elsewhere. One of the main stenciled faces I have recognized all over the place is that of Alaa abd al Fattah, the recently-freed Egyptian blogger who had been imprisoned for several months for allegedly inciting violence at a protest in October. He advocates for giving civilians fair (i.e. non-military) trials and has become an icon for that movement as well as for free speech and civil liberties in general. An interesting new ad series that has popped up–a plea that capitalizes on revolutionary symbolism. Nowadays when I see a foreigner we give each other the same deer-in-the-headlights look. Besides a close friend who is half-Egyptian, I haven’t seen a single American my entire time here. A few brave Europeans seem to be going about their business as usual. In a country where tourism makes up a huge percentage (around 20%) of the economy, that is weird. When visiting the pyramids in the past, the persistence of the souvenir vendors and camel caretakers was at least offset by the sheer number of tourists on the site. Thankfully my family and I visited this month with an Egyptian friend who served as a guide and helped to (politely) fend people off, as the desperation was palpable. The usually-crowded Egyptian Museum (right off Tahrir Square) was fairly quiet. Restaurants we’ve always known to be extremely popular have been near empty. I feel very conflicted regarding the current lack of tourists. On the one hand, the way that so many Egyptians lives were completely geared toward ensuring the enjoyable séjour of the rich tourist, while they themselves were utterly destitute, always made me a little uncomfortable. Especially in a country like Egypt, which like so many other “developing” countries has struggled with overwhelming foreign influence. Mubarak himself was seen as bending to every whim of the American superpower. (Sorry, my Introduction to Development Studies at Berkeley had a “Tourism” unit–you can imagine there were more than a couple neo-colonial references.) 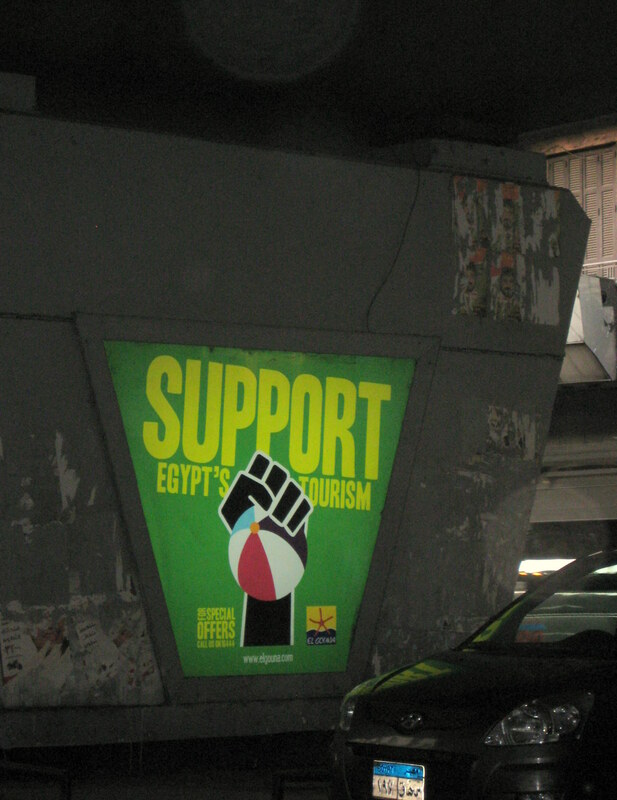 On the other hand, those Egyptians implicated in the massive tourism apparatus are now even poorer. I suppose if the government, and indirectly the economy, were put back in the hands of the people, then measures could be taken to improve the economy and create jobs to the point that tourism would be an added perk, instead of a crutch. But that would be a very long way off. Sure, my family always had close Egyptian friends who would speak their minds in the privacy of someone’s home. But growing up in Cairo, I never heard anyone talking about Mubarak and his regime with a casual acquaintance. My parents have told me that in an office setting, for all their talkative and opinionated co-workers, these kinds of topics were barely ever broached. Since the revolution, though, they tell me everything has changed. It’s all anyone wants to talk about. And I’ve been seeing it myself. Last week a taxi driver told us that Mubarak was “very, very, very, very bad,” and then proceeded to list all American presidents, in order, from Jimmy Carter to Barack Obama (so he officially knows more than the average American citizen), evoking the startling duration of Mubarak’s tyrannical grip on Egypt that lasted for that entire period. Before the revolution, I doubt any taxi driver would have dared to say anything along those lines. Egypt was a police state, freedom of speech was not a right, and so saying anything bad about the government was strictly prohibited. Now, even though free speech continues to be supressed by the military, millions of Egyptians exercise this right regardless, notably by occupying Tahrir square. I am not trying to imply everything in Egypt is now fine and dandy. It’s hard to say what it is. I think the only word that accurately describes it is “uncertain.” A few weeks ago when violence towards protesters flared again after a call to occupy the cabinet building, friends who had participated and were all too aware of the deaths and injuries, were not entirely optimistic. Even if military rule was overthrown (which will be an astonishing feat in and of itself) and elections went forward, the elections come with their own huge mess of problems. But there have also been incredibly inspiring, optimistic moments. On December 20th, a day after the “blue bra” picture of a female protester being stripped and beaten went viral, 1000+ women marched in Tahrir against military rule and the brutal treatment of protesters and women. Luckily, the military and police did not crack down that day and the march remained peaceful. The same occured on December 24th with thousands protesting against military rule, including, according to a friend, old and young, men and women, religious and secular–every kind of person, and a positive energy all around. And of course, as mentioned before, the freeing of Alaa abd al Fattah created incredible momentum. 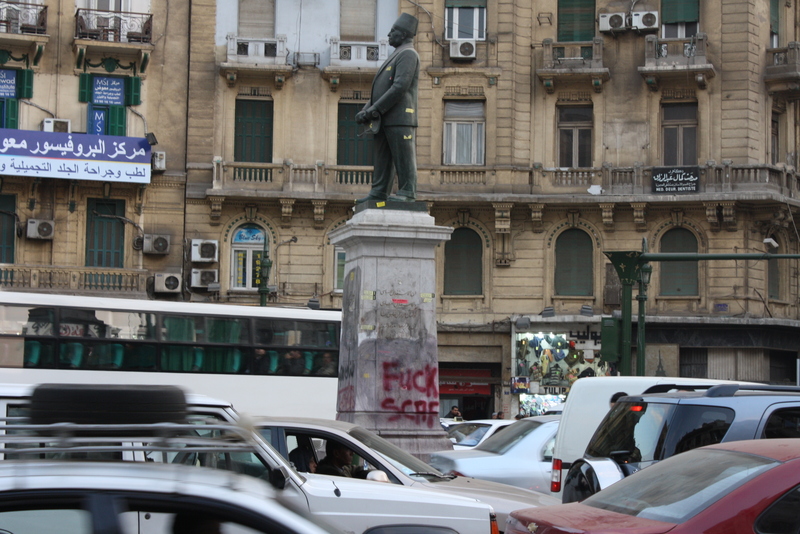 Though the changes in Cairo I’ve mentioned in this post are by no means new to current Cairenes, seeing them all at once inevitably reminded me of the initial euphoria of the revolution. I know there are still innumberable obstacles that face the Egyptian people, obstacles which I probably can’t even begin to comprehend, but I continue to be amazed at what Egyptians have accomplished in this last year and the irreversible changes that began with last January 25th. 2011 witnessed a turn toward uncertainty. But in Egypt, “certainty” and “stability” were merely the hallmarks of the old regime. It was the “certainty” that Mubarak would live forever, and if he didn’t, his legacy would live on in the form of his son or other despotic heirs. I think it’s safe to say that that kind of “stability” is gone forever. 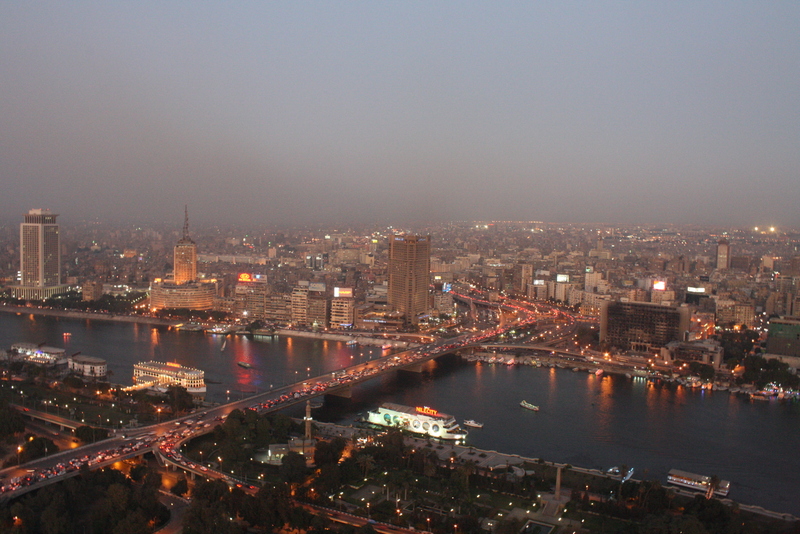 View from the Cairo Tower at dusk. To the right you can see the burned-out building of Mubarak’s National Democratic Party headquarters, set on fire during the revolution. Happy new year, Egypt. And to you too, rest of the globe. May revolution, and uncertainty, flourish in 2012. Hey there, thanks so much for reading! I have a bunch of stuff I will be posting soon so definitely come back anytime!